President Bush, facing tough talks with U.S. allies, said Thursday it would be disastrous if they took their troops out of Iraq. 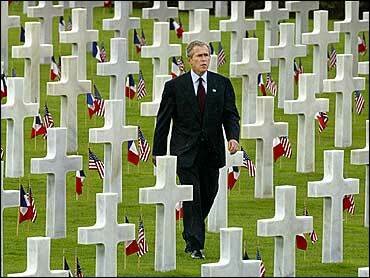 Pulling out, Bush said, would send the wrong signals to the Iraqi people and to terrorists. "It would dispirit those who love freedom in Iraq," he said. Bush, standing alongside Australian Prime Minister John Howard, a strong ally on Iraq, made his comments at the White House before leaving Washington on the first leg of a three-day European trip. Howard renewed his intention to keep Australia's 850 troops in Iraq, despite political criticism in his own country. "It is the worst time imaginable for allies to be showing any weakness in relation to the pursuit of our goals in Iraq," he said. Bush arrived in Rome after midnight local time. He and Secretary of State Colin Powell, national security adviser Condoleezza Rice, White House chief of staff Andrew Card, Bush's chief political adviser Karl Rove and other administration officials were greeted by members of the Italian military in full formal dress. Bush's trip opened a month of high-level diplomacy that will bring him face to face with other staunch supporters on Iraq, including Italian Prime Minister Silvio Berlusconi and British Prime Minister Tony Blair, and critics such as French President Jacques Chirac and German Chancellor Gerhard Schroeder. Various demonstrations, including one expected to draw thousands of people Friday, were planned to protest the war in Iraq. Most of the center of Rome will be closed to traffic and airspace over it will be restricted. About 10,000 police will be deployed during Bush's visit, Italian officials said. Hours before Bush arrived in Rome, several mortar shells were fired at the Italian Embassy in Baghdad, the Foreign Ministry in Rome said. Italian officials said some Iraqis died, but an Iraqi police officer in Baghdad said one Iraqi was killed. No Italians were hurt in the attack, the ministry said. Bush has said he will use his upcoming meetings with allies to drum up support for a new U.N. Security Council resolution dealing with post-occupation Iraq. His visit to Italy marks the 60th anniversary of the liberation of Rome by Allied forces on June 4, 1944. In addition to meetings with Berlusconi and other Italian officials, Bush is meeting Friday at the Vatican with Pope John Paul II, a critic of the Iraq war. In an interview with Italian television before he left Washington, Bush said: "Look, a lot of people didn't like the war. I understand that completely. And I don't like war." "I will tell his Holy Father I appreciate his positions — he is a great man — and that I look forward to working with the Iraqis to put in place the conditions so that human rights prevail, something that didn't happen under Saddam Hussein," Bush said. Vatican officials say the meeting is intended to be forward-looking and that the pope supported efforts to restore sovereignty to Iraq. Bush announced earlier Thursday that he had lost a key member of his war council. Moments before he left for Rome, Bush said CIA Director George Tenet was resigning for personal reasons after seven years in that post. Tenet has come under increasing criticism for intelligence lapses on Iraq, including expectations that Saddam had weapons of mass destruction. The failure to find such weapons has drawn especially sharp criticism in Europe. From Rome, Bush travels Saturday to France, where he will meet with Chirac in Paris before heading to Normandy on Sunday to participate in a ceremony commemorating the 60th anniversary of D-Day. He will then go immediately to Sea Island, Ga., to serve as host for the annual Group of Eight economic summit of major democracies. Later in the month, he travels to Ireland for a European Union summit and to Turkey for a NATO meeting. At the White House, Bush thanked Howard for supporting him on Iraq and assured him the United States would treat fairly the two Australian terror suspects detained in Guantanamo Bay, Cuba. Bush said the U.S. military would fully investigate any allegations of mistreatment of people held there. Howard, who has served three terms as prime minister, is expected to call an election before the U.S. presidential election in November. His likely opponent, opposition Labor Party leader Mark Latham, has accused Howard of leading Australia into a fruitless conflict by sending troops to Iraq.